Are you interested in a beautiful windmill? I have the windmills and wood towers. Right now I have a special on a complete windmill and wood tower. This windmill can pump if you want it to by adding the well assembly kit. It’s a 6′ diameter windmill with a beautiful hardwood tower that stands 16′ tall. The base dimensions are 5 1/2″ by 5 1/2″. This comes to you preassembled (some assembly required) with easy step by step instructions. The kit also contains the anchor posts, oil, turn off system AND the 10 year warranty too! The price for this complete system is $3650. This is a wonderful system and it can even pump water with the optional Well Assembly Kit for $660, including the freight. I also have a deep Well Assembly Kit for $1380, including the freight. Ask about those details. If you only want the windmill and want to build your own wood tower, I throw the wood tower plans in at no extra charge…or you can purchase the wood tower plans separately for $100. My new windmills come in 6′ to 16′ diameter. You can get a new windmill with old blades and tail, if you like. Whatever you need, I can get it to you within 10 days. 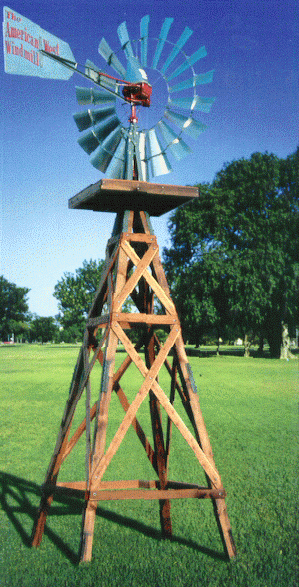 PLEASE let me know if this beautiful windmill and tower or the optional well assembly kits appeal to you. Order one today! It’s been a favorite gift for ALL my customers!